Here at Utility Asset Management, our goal is to provide the customer with the best-fit solution for their pole inspection and make ready needs. We offer both Traditional Bore and Non Destructive Evaluation pole inspections, as well as Treatments, Fiber Make Ready Measurements and Joint-Use Audits. By offering make-ready, inspections, audits and treatments in one visit to the pole, we are able to save our customers more money and get better results from a pole visit. Not every pole needs to be drilled. 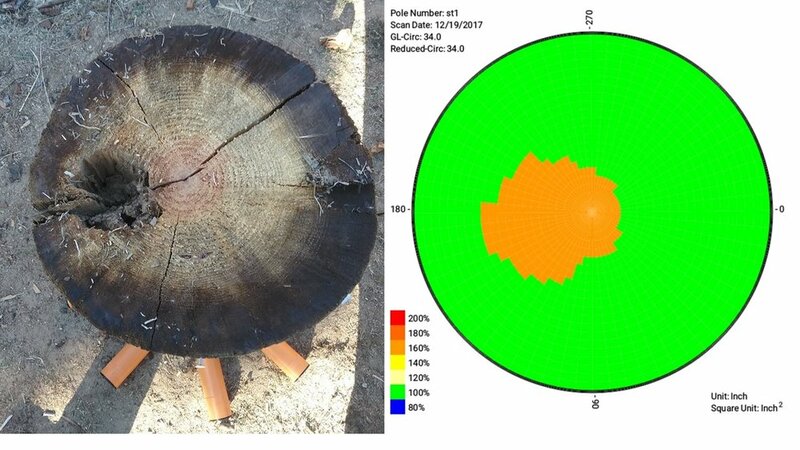 Ultrasonic tomography allows you to identify good wood before damaging it, so you only drill the poles that need further testing. Our inspections focus on getting you all the results in a single visit to the pole. The data along with pictures and ultrasonic scans of each pole can be easily accessed and managed through our GRIDMGR platform. Our pole inspections are priced to be competitive with traditional sound-and-bore methods. We offer simultaneous joint-use and below-groundline inspections to save you more money per pole. Ultrasonic tomography testing gives the same pass/fail result as a normal inspection, but also shows a detailed map of the pole, outlining faulty areas where rot or defects are occurring.